Caters for many budgets from simple fan rooms to air-conditioned rooms with amenities such as cable TV, refrigerator, wardrobe. 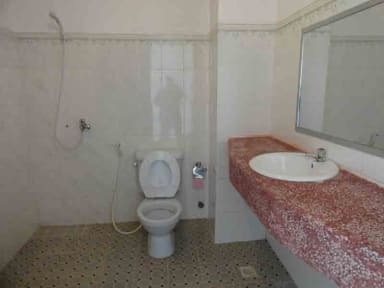 Most bathrooms feature a full-size bathtub, all bathrooms feature shower, instant hot & cold water and western toilet. Our roof top have view of the tower of temple in the far and many local restaurants, banks, mini mart can be found nearby. 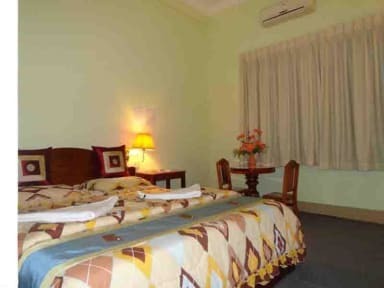 Situated 200m from the biggest local market in Siem Reap (Psa Leu). We provide additional services and facilities designed to ensure your stay is both pleasurable and memorable: restaurant and lobby, room service. Free pick up on arrival and departure. Free daily drop off to Pub Street / Old Market area. Free tea and coffee . Das Personal ist freundlich und hilfsbereit. Das Frühstück ist sehr gut. Preis Leistung sehr gut Im Zimmer ist ein Kühlschrank und ein Kocher nebst Tee und Kaffee. A beautiful and quiet place, nice rooms and a nice common area. The staff is very friendly. The place is not located close to the center, but the staff provides one free ride with the tuk tuk to the night market(only one way). There is a local market just next to the guesthouse.